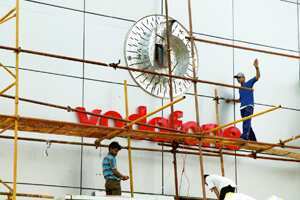 New Delhi: The world’s largest mobile phone company, Vodafone Group Plc., has cut its full-year sales forecast for the second time in four months and said it will reduce costs after revenue slowed in some markets amid an economic slowdown. Vodafone, which is present in India as Vodafone Essar Ltd after acquiring the country’s third largest wireless provider last summer for $10.7 billion (Rs50,932 crore) saw its India revenues grow slower in the quarter gone by to Rs8,816.97 crore, assuming the group owned the business for the whole of both periods, a statement from the company said on Tuesday. Vodafone Essar saw total additions of around 10.5 million new subscribers in the quarter, bringing the closing customer base to 54.6 million, showing an increase of 53.2% in comparison to the same date last year. The firm says that adjusted operating profit was Rs52.30 crore with the customer costs increasing at a lower rate than revenue, benefiting from economies of scale. Licensing costs increased as discounts received from the regulator in some service areas have been terminated. The company also saw a huge expansion in its network with an average of 2,000 base stations constructed every month during the period, including in new service areas, while site sharing increased and the joint venture, Indus Towers, launched and steadily increased its operations. Sales in the year ending March 2009 will be £38.8 billion (Rs2.89 trillion) to £39.7 billion, the company said in the statement. It initially forecast sales of £39.8 billion to £40.7 billion, and said in July sales would be “around the bottom" of that range after slowing economic growth hurt revenue from phone calls and handsets.